Artist impression of general Reincarnated McMansion strategy. Artist Mathieu Gallois and architects Jan O’Connor, Tone Wheeler and Peter Smith present The Reincarnated McMansion Project. 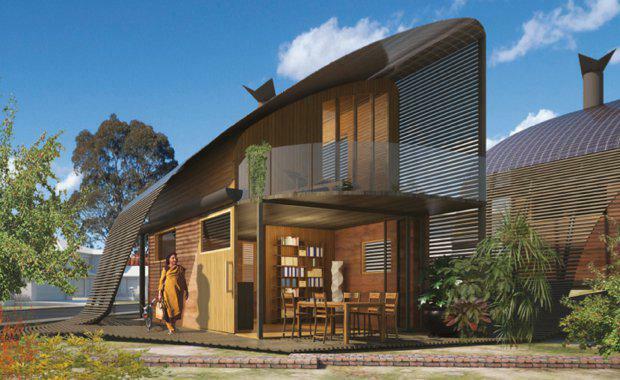 Transforming an unsustainable McMansion into two best practice, zero emissions green homes, the ground breaking The Reincarnated McMansion Project proposes to re-use the remains of the demolished mansion - in the reconstruction of the new homes. Well known green architect Tone Wheeler (ABC New Inventors judge, architect for the Big Brother green house) identifies the benefits of the project. “Not only will our approach result in huge savings in material costs, our strategy will also reduce the carbon footprint of the new homes by an estimated 85%," he said. “To build a new McMansion creates over sixty tonnes of C02,” said team member Peter Smith. Project conceiver, Mathieu Gallois, who spent part of his childhood in a McMansion-like home, notes why this project is so crucial. “The project demonstrates alternatives to unsustainable housing models and draws attention to issues of sustainability in existing housing. In the face of Sydney’s housing affordability crisis, The Reincarnated McMansion Project provides a real solution to the financial challenges of owning a home in Sydney in 2015," Mr Gallois said. Now 50% funded and at a critical juncture, The Reincarnated McMansion Project is seeking home buyers to purchase one of the new zero emission green homes for as little as $450k. These investors will have major input into the project, helping find a site and driving the architectural design of their new home. Director of Casula Powerhouse Arts Centre Kiersten Fishburn said, "The Reincarnated McMansion Project takes a fresh approach to the issues facing potential home-owners in Sydney and provides a beautifully simple solution. "The Reincarnated McMansion Project is sponsored by Arup, Australia Council for the Arts, Smith & Tzannes, Environa Studio and Casula Powerhouse Arts Centre.